by Ted Arnold, et al. 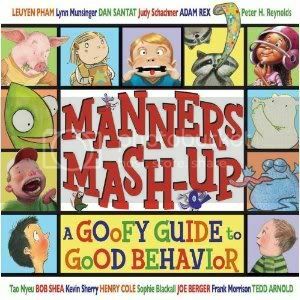 This collection by renowned children's illustrators covers proper etiquette for a wide range of situations: on the bus, at dinner, on the playing field, at the theatre, at the supermarket. Most of the tips are dispensed with humor. As an adult, I found the transition from one illustrator to the next quite jarring, but I know that when I was younger, I would have loved the variety. In his Bus Manners segment, Bob Shea (of Dinosaur vs. the Potty fame) pairs advice such as: "Don't practice your trombone" with a monkey heedlessly noodling away in the backseat much to his fellow passenger's dismay, "Don't soak your seatmate with sleep drool" shows a bear drooling on an unfortunate owl, while "Say 'excuse me' when you make a smell" shows a unapologetically grinning skunk. Leuyen Pham, probably best known for Freckleface Strawberry, offers a sweet lesson in Playground Manners with advice as "No throwing sand in the sandbox" and "Always watch out for little ones" and "It's nice to share" with cute animals all playing happily at the park. Contrast this with Adam Rex, the author/illustrator of Frankenstein Makes a Sandwich who gives us a macabre scene of a three-headed boy, greedily wolfing down disembodied feet, as a mad scientist cautions them to chew with their mouths closed, don't talk with your mouth full, and no elbows or feet on the table. Tao Nyeu, creator of Wonder Bear and Bunny Days presents a beautifully hand-stitched cautionary on a disgusting topic: Please Dont Pick in Public showing the hazards of picking one's toenails, scabs, teeth, nose or wedgie in public.